Bali’s airport was closed early Monday after ash, which can pose a deadly threat to aircraft, reached its airspace. Flight information boards showed rows of cancellations as tourists arrived at the busy airport expecting to catch flights home. Airport spokesman Air Ahsanurrohim said 445 flights were canceled, stranding about 59,000 travelers. The airport is tentatively scheduled to reopen on Wednesday at 7 a.m. local time. The closure had a ripple effect across Indonesia, causing delays at other airports because Bali’s I Gusti Ngurah Rai Airport is a national hub with many transiting flights. Indonesia’s Directorate General of Land Transportation said 100 buses were being deployed to Bali’s international airport and to ferry terminals to help travelers stranded by the eruption. The agency’s chief said major ferry crossing points have been advised to prepare for a surge in passengers and vehicles. Stranded tourists could leave Bali by taking a ferry to Java and then traveling by land to the nearest airports. Indonesia’s tourism ministry said member hotels of the Indonesia Hotel and Restaurant Association will provide a night’s free accommodation to people affected by the airport closure. 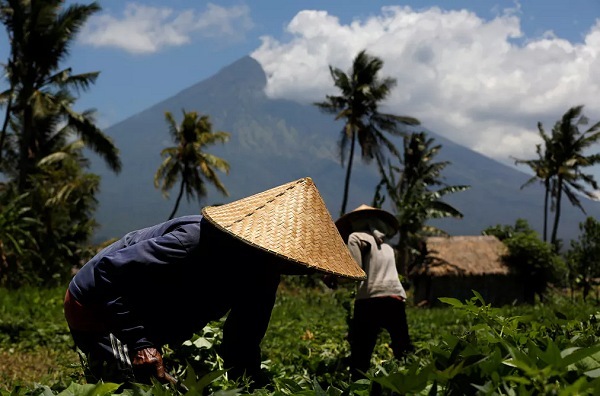 Mount Agung has been hurling clouds of white and dark gray ash about 9,800 feet into the atmosphere since the weekend and lava is welling up in the crater, sometimes reflected as a reddish-yellow glow in the ash plumes. Its explosions can be heard about 7 miles away. Videos released by the National Disaster Mitigation Agency showed a mud flow of volcanic debris and water known as a lahar moving down the volcano’s slopes. It said lahars could increase because it is rainy season and warned people to stay away from rivers. The agency raised the volcano’s alert to the highest level early Monday and expanded the danger zone to 6 miles. It said a larger eruption is possible. The volcano’s last major eruption in 1963 killed about 1,100 people.